What Is A Stock Holding and How Do You Value It? Total Return With Dividends Reinvested – A Myth! 1) What is a cumulative return? 2) How do you calculate a cumulative return using geometric linking? 3) What is an annualized return? 4) How do you calculate an annualized return? What Is A Cumulative Return For An Investment Portfolio? A cumulative return measures, in percentage terms, how much your investments grew or declined over a specified period of time. In other words, how much wealth you accumulated or lost due to your investments over time. For example, let’s say a portfolio starts with $100. Due to the investments held, five years later it is worth $130. 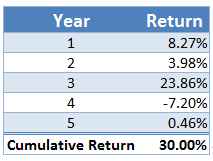 The 5 year cumulative return is 30% (calculated as $30 gain / $100 beginning value, since there are no flows). A cumulative return can be calculated for any period of time (e.g. a 5 day cumulative return is the return earned over 5 days, a 5 year cumulative return is the return over 5 years, a since inception cumulative return is the return since the portfolio incepted). How Do You Calculate A Cumulative Return? In the above example, I showed how you can calculate a cumulative return by taking the gain/loss over the beginning market value. We took the $30 gained over five years and divided it by the $100 starting value to get a 30% return. The following is an example where we have 5 annual returns. These will be used to calculate cumulative and annualized returns. Now that we have our periodic returns, how do we combine them to get the 5 year cumulative return? 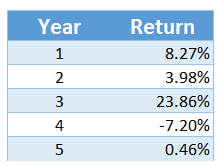 Can we just add the 5 annual returns together? No. You need to use something called “geometric linking.” But don’t worry, it’s not as scary as it sounds. This formula is used because money, including profits and losses, from the current period is reinvested into the next period. If you want to know all the details behind geometric linking and why you need to use it, please read this post on geometric linking. In practice, many investment firms use software to calculate a geometrically linked return, but you can also calculate it in Excel using a function called PRODUCT. The PRODUCT function allows you to highlight the series of returns and it will multiply them together. This is what Performance Analysts typically use to geometrically link. If we apply the product formula to our series of 5 returns we get 30%. Note: the Excel document is locked but you can save a copy and then edit as you like. What Is An Annualized Return For An Investment Portfolio? An annualized return shows you what the average annual return was over a certain time period. In our example, we earned 30% over a 5 year period, the annualized return will tell you what your average return is for each year. This is due to the fact that money from the current period, including profits and losses, is reinvested in the next period. So to calculate the annualized (aka “annual average”) return, we need to reflect that principle of reinvestment. So How Do You Calculate An Annualized Return? What annual return, when linked over the years, will give you the correct cumulative return? 1) The “1 + Cumulative Return” represents the initial investment (the number 1) and the total aggregated return for the entire period (the cumulative return). 2) The raising to”1/number of years” is similar to dividing by the number of years, but since we are linking the returns together this essentially “unlinks” them. 3) The subtracting of 1 at the end removes the 1 that was used to represent the initial investment, so the return is isolated. Ex) You earned 30% over 5 years. What is the annualized return and what does that mean in plain English? If we divided the 30% by 5, it would give you 6%, but you can see the correct answer is 5.39%. The difference between the arithmetic division (incorrect approach) and the geometric division (correct approach) will increase as the absolute returns get larger and the number of periods decrease. What does the 5.39% represent in plain English? This is the same as saying if you earn 5.39% each year, and compound it, that will give you your 30% return (the cumulative return). I hope you found this helpful. Please let me know your thoughts below or send me a direct message at info@learninvestmentperformance.com. Thank you for visiting! I want to hear from you so please feel free to contact me at info@learninvestmentperformance.com. Click Here to Contact Me - The Site Content Depends on you!